Extend from $.fn.datebox.defaults, Override defaults with $.fn.datetimebox.defaults. 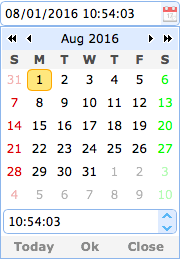 Similar to the datebox, the datetimebox allows the user to select a date and a time to display the date and time with specified format. It adds a timespinner component to the drop-down panel. The methods extend from datebox, below is the overridden methods for datetimebox. spinner none Return the timespinner object. setValue value Set the datetimebox value. cloneFrom from Clone the datetimebox from a source datetimebox. Available since version 1.4.1.